McCain, who has been critical of the Obama administration's response to the crisis in Crimea, said the White House should target Russia's oil exports. 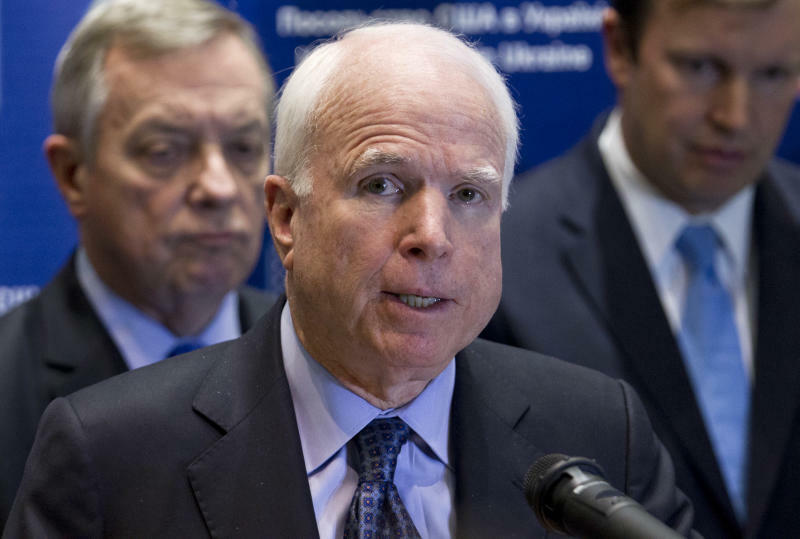 Speaking in Kiev with a delegation of fellow U.S. senators on Saturday, McCain called for the United States to provide long-term military support — both "lethal and non-lethal" equipment — to Ukraine. "[It is] the right and decent thing to do," McCain said. In a New York Times op-ed published Saturday, the Republican senator sharpened his criticism of the president. "Crimea has exposed the disturbing lack of realism that has characterized our foreign policy under President Obama," McCain wrote. "It is this worldview, or lack of one, that must change." McCain added: "Crimea must be the place where President Obama recognizes this reality and begins to restore the credibility of the United States as a world leader."